This is the new root container class. It will hold some attributes that are used by all datamodels, e.g.the global function database and the configuration, and it will hold a list of datamodels. Currently all methods to create new instances of CCopasiRootContainer are declared private. This ensures that there can be only one root container which is initialized by the init method. If this is necessary or not needs to be discussed. Definition at line 41 of file CCopasiRootContainer.h. The default constructor should be private so that nobody can create new instances of the root container. The only way to create a root container is through the static init method. Maybe this restriction is not necessary. We have to discuss this later. The default constructor should be private so that nobody can create new instances of the root container. The only way to create a root container is through the static init method. Definition at line 35 of file CCopasiRootContainer.cpp. The copy constructor is private as well to make sure that there is only one root container that can be initialized through the init call. Definition at line 47 of file CCopasiRootContainer.cpp. References mpConfiguration, mpDataModelList, mpFunctionList, mpUndefined, mpUnknownResource, mWithGUI, pdelete, and CConfigurationFile::save(). Creates a new datamodel instance and adds it to the list. The new instance is returned by the method. Definition at line 149 of file CCopasiRootContainer.cpp. References CCopasiVector< T >::add(), mpDataModelList, and mWithGUI. Referenced by Arguments::handleCommandLine(), main(), test000022::setUp(), test000030::setUp(), test000046::setUp(), test000047::setUp(), test000031::setUp(), test000048::setUp(), test000049::setUp(), test000023::setUp(), test000032::setUp(), test000050::setUp(), test000051::setUp(), test000033::setUp(), test000052::setUp(), test000090::setUp(), test000024::setUp(), test000034::setUp(), test000054::setUp(), test000055::setUp(), test000035::setUp(), test000056::setUp(), test000057::setUp(), test000025::setUp(), test000036::setUp(), test_compare_utilities::setUp(), test000037::setUp(), test000021::setUp(), test000026::setUp(), test000038::setUp(), test000039::setUp(), test000027::setUp(), test000040::setUp(), test000041::setUp(), test000028::setUp(), test000042::setUp(), test000043::setUp(), test000029::setUp(), test000044::setUp(), test000045::setUp(), test000072::setUp(), test000078::setUp(), test000079::setUp(), test000080::setUp(), test000091::setUp(), test000093::setUp(), test000073::setUp(), test000074::setUp(), test000068::setUp(), test000070::setUp(), test000071::setUp(), test000069::setUp(), test000075::setUp(), test000089::setUp(), test000094::setUp(), test000065::setUp(), test000067::setUp(), test000088::setUp(), test000062::setUp(), test000061::setUp(), test000103::setUp(), test000060::setUp(), test000076::setUp(), test000104::setUp(), test000081::setUp(), test000053::setUp(), test000102::setUp(), test000099::setUp(), test000098::setUp(), test000100::setUp(), test000087::setUp(), test000058::setUp(), test000101::setUp(), test000066::setUp(), test000092::setUp(), test000063::setUp(), test000077::setUp(), test000095::setUp(), test000097::setUp(), test000082::setUp(), test000086::setUp(), test000059::setUp(), test000064::setUp(), test000083::setUp(), test000085::setUp(), test000084::setUp(), stress_test::stress_test(), Copasi2SBMLTranslator::translate(), Copasi2SBMLTranslator::translateFileToSBML(), and Copasi2SBMLTranslator::translateToSBML(). Definition at line 92 of file CCopasiRootContainer.cpp. References COptions::cleanup(), pdelete, pRootContainer, and CFunctionParameterMap::pUnmappedObject. Referenced by main(), test_simplify::tearDown(), test_depth_first_iterator::tearDown(), test_compare_utilities::tearDown(), test000026::tearDown(), test000034::tearDown(), test000050::tearDown(), test000051::tearDown(), test000035::tearDown(), test000052::tearDown(), test000027::tearDown(), test000036::tearDown(), test000054::tearDown(), test000090::tearDown(), test000055::tearDown(), test000037::tearDown(), test000056::tearDown(), test000057::tearDown(), test000028::tearDown(), test000038::tearDown(), test000039::tearDown(), test000022::tearDown(), test000023::tearDown(), test000040::tearDown(), test000029::tearDown(), test000041::tearDown(), test000021::tearDown(), test000024::tearDown(), test000030::tearDown(), test000042::tearDown(), test000043::tearDown(), test000031::tearDown(), test000044::tearDown(), test000045::tearDown(), test000025::tearDown(), test000032::tearDown(), test000046::tearDown(), test000047::tearDown(), test000033::tearDown(), test000048::tearDown(), test000049::tearDown(), test000072::tearDown(), test000091::tearDown(), test000093::tearDown(), test000068::tearDown(), test000069::tearDown(), test000080::tearDown(), test000070::tearDown(), test000078::tearDown(), test000074::tearDown(), test000071::tearDown(), test000073::tearDown(), test000079::tearDown(), test000075::tearDown(), test000089::tearDown(), test000094::tearDown(), test000065::tearDown(), test000067::tearDown(), test000062::tearDown(), test000088::tearDown(), test000103::tearDown(), test000060::tearDown(), test000061::tearDown(), test000076::tearDown(), test000104::tearDown(), test000053::tearDown(), test000081::tearDown(), test000098::tearDown(), test000102::tearDown(), test000099::tearDown(), test000100::tearDown(), test000087::tearDown(), test000058::tearDown(), test000096::tearDown(), test000101::tearDown(), test000066::tearDown(), test000092::tearDown(), test000063::tearDown(), test000077::tearDown(), test000095::tearDown(), test000097::tearDown(), test_biomodels217_expression::tearDown(), test000082::tearDown(), test000086::tearDown(), test000059::tearDown(), test000064::tearDown(), test000084::tearDown(), test000083::tearDown(), test000085::tearDown(), and stress_test::~stress_test(). Returns the a pointer to the configuration. Definition at line 131 of file CCopasiRootContainer.cpp. Referenced by CQLayoutsWidget::createLayoutWindow(), DataModelGUI::exportSBMLFinished(), CQExpressionWidget::getExpression(), CopasiFileDialog::getOpenFileName(), CopasiFileDialog::getSaveFileName(), DataModelGUI::importSBMLFinished(), CQPreferenceDialog::init(), CQExpressionWidget::keyPressEvent(), DataModelGUI::loadModelFinished(), CopasiFileDialog::openExampleDir(), SBMLImporter::parseSBML(), CopasiUI3Window::refreshRecentFileMenu(), CopasiUI3Window::refreshRecentSBMLFileMenu(), DataModelGUI::saveModelFinished(), CopasiUI3Window::setApplicationFont(), SliderDialog::sliderValueChanged(), CQPreferenceDialog::slotBtnOk(), CQExperimentData::slotExperimentAdd(), CopasiUI3Window::slotFontSelection(), CopasiUI3Window::slotOpenRecentFile(), CopasiUI3Window::slotOpenRecentSBMLFile(), CopasiUI3Window::slotUpdateMIRIAM(), CopasiUI3Window::slotUpdateMIRIAMFinished(), CopasiFileDialog::StartWith(), and CQMiriamWidget::updateResourcesList(). 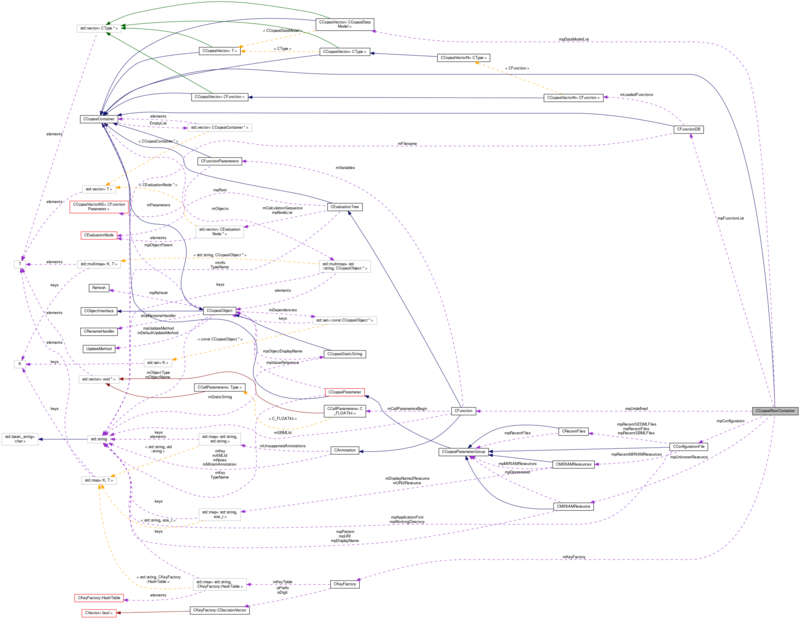 Returns a pointer to the list of data models. Definition at line 143 of file CCopasiRootContainer.cpp. Referenced by CQReportDefinitionSelect::accept(), CQPlotSubwidget::addCurve2D(), SliderDialog::addSlider(), CopasiUI3Window::autoSave(), SliderSettingsDialog::browseButtonPressed(), CQReportDefinition::btnItemClicked(), CQReportDefinition::btnNewReportClicked(), DataModelGUI::buildChangedObjects(), CQTrajectoryWidget::checkTimeSeries(), TaskWidget::commonAfterRunTask(), TaskWidget::commonRunTask(), COutputHandlerPlot::compile(), CQMessageBox::confirmDelete(), CopasiUI3Window::CopasiUI3Window(), CQValidatorExpression::CQValidatorExpression(), CQValidatorFunction::CQValidatorFunction(), CQGLNetworkPainter::createDataSets(), CQLayoutsWidget::createLayoutWindow(), DataModelGUI::createModel(), SliderDialog::createNewSlider(), CQReportDM::data(), CQPlotDM::data(), CQReactionDM::data(), CQEventDM::data(), CQGlobalQuantityDM::data(), CQCompartmentDM::data(), CQSpecieDM::data(), DataModelGUI::DataModelGUI(), CQPlotSubwidget::deletePlot(), CQLayoutsWidget::deleteSelectedLayouts(), CQTSSAResultSubWidget::displayResult(), SliderDialog::editSlider(), CQOptimizationResult::enterProtected(), CQFittingResult::enterProtected(), CQTSSAResultWidget::enterProtected(), CQSensResultWidget::enterProtected(), CQLayoutsWidget::enterProtected(), SliderDialog::equivalentSliderExists(), DataModelGUI::exportMathModelRun(), exportSBML(), DataModelGUI::exportSBMLRun(), DataModelGUI::exportSBMLToStringRun(), fillItemFromImage(), ReactionsWidget1::FillWidgetFromRI(), CQSpecieDM::flags(), SliderDialog::getCSlidersForObject(), CQExpressionWidget::getExpression(), Arguments::getFirstScheduledTask(), CCopasiSelectionDialog::getObjectSingle(), CCopasiSelectionDialog::getObjectVector(), SliderDialog::getTaskForFolderId(), Arguments::getTaskForName(), CQReactionDM::headerData(), CQCompartmentDM::headerData(), CQSpecieDM::headerData(), DataModelGUI::importCellDesigner(), DataModelGUI::importSBMLFinished(), CopasiUI3Window::importSBMLFromString(), DataModelGUI::importSBMLFromStringFinished(), DataModelGUI::importSBMLFromStringRun(), DataModelGUI::importSBMLRun(), CQTSSAResultSubWidget::init(), CQReportDM::insertRows(), CQPlotDM::insertRows(), CQReactionDM::insertRows(), CQEventDM::insertRows(), CQGlobalQuantityDM::insertRows(), CQCompartmentDM::insertRows(), CQSpecieDM::insertRows(), CQParameterOverviewWidget::leave(), FunctionWidget1::leave(), DataModelGUI::linkDataModelToGUI(), CQMoietiesTaskResult::load(), CScanWidgetRandom::load(), CScanWidgetScan::load(), CQCompartment::load(), CQExpandModelData::load(), CQMergingData::load(), StateSubwidget::loadAll(), CLNAResultWidget::loadFromBackend(), CMCAResultWidget::loadFromBackend(), CQTSSAResultWidget::loadFromBackend(), CQLyapResultWidget::loadFromBackend(), Curve2DWidget::LoadFromCurveSpec(), BandedGraphWidget::LoadFromCurveSpec(), HistoWidget::LoadFromCurveSpec(), ReactionsWidget1::loadFromReaction(), CQMathMatrixWidget::loadMatrices(), DataModelGUI::loadModelFinished(), DataModelGUI::loadModelRun(), CQMCAWidget::loadParameterTable(), CQLNAWidget::loadParameterTable(), FunctionWidget1::loadParameterTable(), CQReportDefinitionSelect::loadReportDefinitionVector(), CQSteadyStateResult::loadResult(), CQLayoutMainWindow::loadSBMLFile(), CQExperimentData::loadTable(), CQLyapWidget::loadTask(), ScanWidget::loadTask(), SensitivitiesWidget::loadTask(), CQTrajectoryWidget::loadTask(), CQUpdatesWidget::loadWidget(), main(), CopasiUI3Window::newDoc(), CQSensResultWidget::newResult(), CQSimpleSelectionTree::populateTree(), Arguments::prepareModel(), CCSPMethod::printResult(), CQSpeciesWidget::refreshCompartments(), DataModelGUI::refreshInitialValues(), CQReportListItem::refreshText(), removeDatamodel(), CFunctionDB::removeFunction(), CQFunctionDM::removeRows(), CQReportDM::removeRows(), CQPlotDM::removeRows(), CQReactionDM::removeRows(), CQEventDM::removeRows(), CQGlobalQuantityDM::removeRows(), CQCompartmentDM::removeRows(), CQSpecieDM::removeRows(), SliderDialog::removeSlider(), CQReportDM::rowCount(), CQPlotDM::rowCount(), CQReactionDM::rowCount(), CQEventDM::rowCount(), CQGlobalQuantityDM::rowCount(), CQCompartmentDM::rowCount(), CQSpecieDM::rowCount(), SliderDialog::runCrossSectionTask(), SliderDialog::runLNATask(), SliderDialog::runMCATask(), SliderDialog::runOptimizationTask(), SliderDialog::runParameterEstimationTask(), SliderDialog::runScanTask(), CQTSSAWidget::runTask(), SliderDialog::runTimeCourse(), CQReportDefinition::save(), CQCompartment::save(), CQModelValue::save(), CQTSSAResultSubWidget::saveDataToFile(), DataModelGUI::saveModelRun(), CQLNAWidget::saveParameterTable(), CQMCAWidget::saveParameterTable(), CQLyapWidget::saveTask(), CQMCAWidget::saveTask(), CQLNAWidget::saveTask(), CQFittingWidget::saveTask(), CQOptimizationWidget::saveTask(), CQTrajectoryWidget::saveTask(), CQEventWidget1::saveToEvent(), CQSensResultWidget::saveToFile(), ReactionsWidget1::saveToReaction(), CQPlotSubwidget::selectPlotItem(), CQReportDM::setData(), CQPlotDM::setData(), CQReactionDM::setData(), CQEventDM::setData(), CQGlobalQuantityDM::setData(), CQCompartmentDM::setData(), CQSpecieDM::setData(), ListViews::setDataModel(), CQReactionDM::setEquation(), CQExpressionWidget::setExpression(), SliderDialog::sliderObjectChanged(), CopasiUI3Window::slotApplyInitialState(), CQPlotsWidget::slotBtnActivateAllClicked(), CQPlotsWidget::slotBtnDeactivateAllClicked(), ReactionsWidget1::slotBtnDelete(), CQCompartment::slotBtnDelete(), CQModelValue::slotBtnDelete(), CQEventWidget1::slotBtnDelete(), ReactionsWidget1::slotBtnNew(), CQSpeciesDetail::slotBtnNew(), CQCompartment::slotBtnNew(), CQModelValue::slotBtnNew(), CQEventWidget1::slotBtnNew(), CQLayoutsWidget::slotBtnNewClicked(), CopasiUI3Window::slotCheckModel(), CopasiUI3Window::slotConvertToIrreversible(), DefaultPlotDialog::slotCreate(), CQMoietiesTaskResult::slotCreateGlobalQuantity(), CQPlotsWidget::slotDoubleClicked(), CQReactionsWidget::slotDoubleClicked(), CQReportsWidget::slotDoubleClicked(), CQEventsWidget::slotDoubleClicked(), CQCompartmentsWidget::slotDoubleClicked(), CQGlobalQuantitiesWidget::slotDoubleClicked(), CQSpeciesWidget::slotDoubleClicked(), CQReportDefinitionSelect::slotEdit(), CopasiUI3Window::slotExportMathModel(), CopasiUI3Window::slotExportSBML(), CopasiUI3Window::slotFileOpen(), CopasiUI3Window::slotFileOpenFinished(), CopasiUI3Window::slotFileSave(), CopasiUI3Window::slotFileSaveFinished(), CopasiUI3Window::slotImportSBML(), CopasiUI3Window::slotImportSBMLFinished(), CopasiUI3Window::slotImportSBMLFromStringFinished(), ListViews::slotNotify(), CopasiUI3Window::slotQuit(), CLNAResultSubwidget::slotSave(), CMCAResultSubwidget::slotSave(), CQLayoutsWidget::slotShowLayout(), CQExperimentData::slotTypeChanged(), CopasiUI3Window::slotUpdateInitialState(), CQDifferentialEquations::slotUpdateWidget(), StateSubwidget::update(), CQTrajectoryWidget::updateIntervals(), CQMiriamWidget::updateResourcesList(), CopasiUI3Window::updateTitle(), and validate(). Returns a pointer to the global function database. Definition at line 137 of file CCopasiRootContainer.cpp. Referenced by CCopasiXML::buildFunctionList(), CEvaluationNodeCall::calls(), CSBMLExporter::checkForPiecewiseFunctions(), CSBMLExporter::collectIds(), CEvaluationNodeCall::compile(), CFunction::completeFunctionList(), CQMessageBox::confirmDelete(), CModel::convert2NonReversible(), CSBMLExporter::createEvent(), CSBMLExporter::createFunctionDefinitions(), CSBMLExporter::createInitialAssignment(), CSBMLExporter::createRule(), CQFunctionDM::data(), COptProblem::elevateChildren(), CSBMLExporter::exportEventAssignments(), CODEExporterC::exportSingleFunction(), CODEExporter::exportSingleFunction(), SBMLImporter::findFunctionCalls(), CODEExporter::findFunctionsCalls(), CEvaluationNodeCall::getCalledTree(), CReactionInterface::getListOfPossibleFunctions(), SEDMLImporter::importFirstSBMLModel(), CCopasiDataModel::importSBML(), CCopasiDataModel::importSBMLFromString(), CQFunctionDM::insertRows(), CQFunctionDM::isFunctionReadOnly(), FunctionWidget1::leave(), CQBrowserPaneDM::load(), CModel::load(), DataModelGUI::loadFunctionDB(), CCopasiDataModel::loadModel(), CODEExporter::modifyTreeForMassAction(), stress_test::normalizeFunctionDB(), CCopasiDataModel::ObjectFromCN(), CQFunctionDM::removeRows(), CCopasiDataModel::removeSBMLIdFromFunctions(), SBMLImporter::removeUnusedFunctions(), CQFunctionDM::rowCount(), DataModelGUI::saveFunctionDB(), CQFunctionDM::setData(), CODEExporterC::setExportNameOfFunction(), CQExpressionWidget::setExpression(), CReaction::setFunction(), CReactionInterface::setFunctionAndDoMapping(), CSBMLExporter::setFunctionSBMLIds(), CReactionInterface::setFunctionWithEmptyMapping(), FunctionWidget1::slotBtnDelete(), FunctionWidget1::slotBtnNew(), CQFunctionsWidget::slotDoubleClicked(), ReactionsWidget1::slotNewFunction(), test000058::test_bug1025_10(), test000058::test_bug1025_5(), test000067::test_bug1060(), test_compare_utilities::test_copasi_function_expansion(), test000075::test_import_time_dependent_function_definition(), test000078::test_l2v4_import_unordered_functions(), test000059::test_unique_id_17(), test000059::test_unique_id_18(), test000059::test_unique_id_19(), test000059::test_unique_id_20(), test000059::test_unique_id_21(), test000059::test_unique_id_21_2(), and CEvaluationNodeCall::toAST(). Returns a pointer to the KeyFactory. Definition at line 163 of file CCopasiRootContainer.cpp. Referenced by CModelAdd::addCompartmentsExpressions(), CModelAdd::addMetabolitesExpressions(), CModelAdd::addModelValuesExpressions(), CModel::applyActiveParameterSet(), CQReportDefinition::btnCopyReportClicked(), CCompartment::CCompartment(), CEvent::CEvent(), CFunction::CFunction(), CModelAnalyzer::checkReaction(), CLColorDefinition::CLColorDefinition(), COutputDefinitionVector::cleanup(), CReportDefinitionVector::cleanup(), CReportDefinition::cleanup(), CLEllipse::CLEllipse(), CLGlobalRenderInformation::CLGlobalRenderInformation(), CLGlobalStyle::CLGlobalStyle(), CLGradientStop::CLGradientStop(), CLGroup::CLGroup(), CLImage::CLImage(), CLLinearGradient::CLLinearGradient(), CLLineEnding::CLLineEnding(), CLLocalRenderInformation::CLLocalRenderInformation(), CLLocalStyle::CLLocalStyle(), CLPolygon::CLPolygon(), CLRadialGradient::CLRadialGradient(), CLRectangle::CLRectangle(), CLRenderCurve::CLRenderCurve(), CLText::CLText(), CMetab::CMetab(), CModelEntity::CModelEntity(), CQPlotSubwidget::commitPlot(), CEventAssignment::compile(), CReaction::compile(), CFunctionAnalyzer::constructCallParametersActualValues(), CModelExpansion::SetOfModelElements::contains(), CModelAdd::copyDelayExpression(), CModelAdd::copyEventAssignmentExpression(), CModelAdd::copyExpression(), CModelAdd::copyInitialExpression(), CQPlotSubwidget::copyPlot(), CModelAdd::copyTriggerExpression(), CReaction::CReaction(), CModelParameterSet::createFromModel(), CSBMLExporter::createKineticExpression(), CSBMLExporter::createKineticLaw(), CModelExpansion::createLinearArray(), CSBMLExporter::createMassActionExpression(), CMMLOutput::createParameterMapping(), CModelExpansion::createRectangularArray(), CQEventDM::data(), CEvent::deleteAssignment(), CQPlotSubwidget::deletePlot(), CModelExpansion::duplicateReaction(), CCopasiXMLParser::COPASIElement::end(), CopasiWidget::enter(), CQModelValue::enterProtected(), CQEventWidget1::enterProtected(), CQRDFTreeView::enterProtected(), FunctionWidget1::enterProtected(), CQNotes::enterProtected(), CModelExpansion::ElementsMap::exists(), CSBMLExporter::exportEventAssignments(), CODEExporter::exportKineticFunction(), CODEExporterC::exportTitleData(), FunctionWidget1::functionParametersChanged(), CFitItem::getCrossValidations(), CReactionInterface::getDeletedParameters(), CMetabNameInterface::getDisplayName(), CModelExpansion::ElementsMap::getDuplicateKey(), CObjectLists::getEventTargets(), CFitItem::getExperiments(), CLTextGlyph::getGraphicalObject(), CObjectLists::getListOfConstObjects(), CLMetabReferenceGlyph::getMetabGlyph(), CChemEqElement::getMetabolite(), CLGraphicalObject::getModelObject(), CQModelElementTreeWidgetItem::getObject(), CQSideCompoundWizardPage::CQListWidgetModelItem::getObject(), CTimeSeries::getSBMLId(), CLNAProblem::getSubTask(), CMCAProblem::getSubTask(), CLReferenceGlyph::getTargetGlyph(), CLabel::getText(), CLGraphicalObject::hasValidModelReference(), CSBMLExporter::hasVolumeAssignment(), CReactionInterface::initFromReaction(), CExperiment::initializeParameter(), CModel::initObjects(), CSBMLExporter::isEventAssignmentSBMLCompatible(), CSBMLExporter::isEventSBMLCompatible(), CExperimentSet::keyToIndex(), CODEExporterC::KineticFunction2ODEmember(), FunctionWidget1::leave(), CQNotes::leave(), CQTabWidget::load(), CMIRIAMInfo::load(), CQEventWidget1::loadFromEvent(), CReactionInterface::loadMappingAndValues(), CQFittingItemWidget::loadSelection(), ScanWidget::loadTask(), SensitivitiesWidget::loadTask(), SteadyStateWidget::loadTask(), CModelMerging::mergeInExpression(), SBMLDocumentLoader::postprocessTextGlyph(), CModel::printParameterOverview(), CFitProblem::printResult(), CModelParameter::refreshFromModel(), CModel::removeCompartment(), CModel::removeEvent(), CFunctionDB::removeFunction(), CCopasiDataModel::removeLayout(), CModel::removeLocalReactionParameter(), CModel::removeMetabolite(), CModel::removeModelValue(), COutputDefinitionVector::removePlotSpec(), CModel::removeReaction(), CReportDefinitionVector::removeReportDefinition(), CQPlotSubwidget::resetPlot(), CQLNAWidget::runTask(), CQLyapWidget::runTask(), CQMCAWidget::runTask(), CQFittingWidget::runTask(), CQOptimizationWidget::runTask(), CQTabWidget::save(), CMIRIAMInfo::save(), ScanWidget::saveTask(), SensitivitiesWidget::saveTask(), SteadyStateWidget::saveTask(), CQFittingWidget::saveTask(), FunctionWidget1::saveToFunction(), ReactionsWidget1::saveToReaction(), CQNewMainWindow::selectReaction(), CSlider::setAssociatedEntityKey(), CQReactionDM::setEquation(), ReactionsWidget1::setFramework(), SBMLImporter::setInitialValues(), CChemEqElement::setMetabolite(), CQMiriamWidget::showEvent(), FunctionWidget1::slotBtnDelete(), ReactionsWidget1::slotBtnDelete(), CQFittingItemWidget::slotCrossValidationChanged(), CQParameterSetsWidget::slotDoubleClicked(), CQPlotsWidget::slotDoubleClicked(), CQReportsWidget::slotDoubleClicked(), CQReactionsWidget::slotDoubleClicked(), CQCompartmentsWidget::slotDoubleClicked(), CQEventsWidget::slotDoubleClicked(), CQFunctionsWidget::slotDoubleClicked(), CQGlobalQuantitiesWidget::slotDoubleClicked(), CQSpeciesWidget::slotDoubleClicked(), CQFittingItemWidget::slotExperimentChanged(), ReactionsWidget1::slotGotoFunction(), CQBrowserPaneDM::slotNotify(), CQExperimentData::slotOK(), CQFittingWidget::taskFinishedEvent(), test000075::test_import_time_dependent_function_definition(), test000087::test_simulate_reaction_flux_reference_1(), FunctionWidget1::update(), ReactionsWidget1::update(), CQLayoutScene::updatePosition(), ParameterTable::updateTable(), CReaction::variable2object(), CReactionInterface::writeBackToReaction(), CMMLOutput::writeDifferentialEquations(), CAnnotation::~CAnnotation(), CBiologicalDescription::~CBiologicalDescription(), CCompartment::~CCompartment(), CCopasiParameter::~CCopasiParameter(), CCopasiTask::~CCopasiTask(), CCreator::~CCreator(), CEvent::~CEvent(), CFunction::~CFunction(), CFunctionParameter::~CFunctionParameter(), CLayout::~CLayout(), CLColorDefinition::~CLColorDefinition(), CLEllipse::~CLEllipse(), CLGradientBase::~CLGradientBase(), CLGraphicalObject::~CLGraphicalObject(), CLGroup::~CLGroup(), CLImage::~CLImage(), CListOfLayouts::~CListOfLayouts(), CLPolygon::~CLPolygon(), CLRectangle::~CLRectangle(), CLRenderCurve::~CLRenderCurve(), CLRenderInformationBase::~CLRenderInformationBase(), CLStyle::~CLStyle(), CLText::~CLText(), CMetab::~CMetab(), CModel::~CModel(), CModelParameterSet::~CModelParameterSet(), CModification::~CModification(), CMoiety::~CMoiety(), CReaction::~CReaction(), CReference::~CReference(), and CSlider::~CSlider(). Definition at line 202 of file CCopasiRootContainer.cpp. Referenced by CopasiUI3Window::license(), and CQSplashWidget::slotViewLicense(). Definition at line 196 of file CCopasiRootContainer.cpp. Definition at line 125 of file CCopasiRootContainer.cpp. Referenced by CEvaluationNodeCall::compile(), ObjectBrowserWidget::loadData(), and CCopasiParameter::~CCopasiParameter(). Definition at line 157 of file CCopasiRootContainer.cpp. Referenced by CReaction::calculateParticleFlux(), CReaction::compile(), CReaction::CReaction(), CSBMLExporter::createReaction(), CCopasiXMLParser::KineticLawElement::end(), CReactionInterface::initFromReaction(), CCopasiXML::saveModel(), CReaction::setFunction(), CCopasiXMLParser::KineticLawElement::start(), and test000062::test_kineticlaw_without_math(). Definition at line 169 of file CCopasiRootContainer.cpp. This method creates the only root container. Definition at line 78 of file CCopasiRootContainer.cpp. References CCopasiRootContainer(), COptions::init(), initializeChildren(), and CCopasiMessage::setIsGUI(). Referenced by Arguments::handleCommandLine(), main(), test_simplify::setUp(), test_depth_first_iterator::setUp(), test000022::setUp(), test000030::setUp(), test000046::setUp(), test000047::setUp(), test000031::setUp(), test000048::setUp(), test000049::setUp(), test000023::setUp(), test000032::setUp(), test000050::setUp(), test000051::setUp(), test000033::setUp(), test000052::setUp(), test000090::setUp(), test_compare_utilities::setUp(), test000034::setUp(), test000054::setUp(), test000055::setUp(), test000035::setUp(), test000056::setUp(), test000057::setUp(), test000036::setUp(), test000024::setUp(), test000037::setUp(), test000025::setUp(), test000021::setUp(), test000026::setUp(), test000038::setUp(), test000039::setUp(), test000027::setUp(), test000040::setUp(), test000041::setUp(), test000028::setUp(), test000042::setUp(), test000043::setUp(), test000029::setUp(), test000044::setUp(), test000045::setUp(), test000072::setUp(), test000078::setUp(), test000079::setUp(), test000080::setUp(), test000091::setUp(), test000093::setUp(), test000068::setUp(), test000069::setUp(), test000070::setUp(), test000073::setUp(), test000074::setUp(), test000071::setUp(), test000075::setUp(), test000089::setUp(), test000094::setUp(), test000065::setUp(), test000067::setUp(), test000088::setUp(), test000062::setUp(), test000060::setUp(), test000061::setUp(), test000103::setUp(), test000076::setUp(), test000081::setUp(), test000053::setUp(), test000104::setUp(), test000102::setUp(), test000098::setUp(), test000099::setUp(), test000100::setUp(), test000087::setUp(), test000058::setUp(), test000096::setUp(), test000101::setUp(), test000066::setUp(), test000092::setUp(), test000063::setUp(), test000077::setUp(), test000095::setUp(), test000097::setUp(), test_biomodels217_expression::setUp(), test000082::setUp(), test000086::setUp(), test000059::setUp(), test000064::setUp(), test000084::setUp(), test000085::setUp(), test000083::setUp(), stress_test::stress_test(), Copasi2SBMLTranslator::translate(), Copasi2SBMLTranslator::translateFileToSBML(), and Copasi2SBMLTranslator::translateToSBML(). This method needs to be called after a new root container is constructed. Since many of the children of the root container need to access the key factory through the global Root instance, the global root instance need to be created before the children can be initialized. Calling this Method initializes the children. This method must be protected since it can only be called once by the global init method. 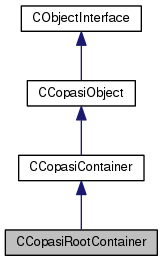 Definition at line 105 of file CCopasiRootContainer.cpp. References CEvaluationTree::compile(), CFunctionDB::load(), mpConfiguration, mpDataModelList, mpFunctionList, mpUndefined, mpUnknownResource, CFunction::setInfix(), CMIRIAMResource::setMIRIAMDisplayName(), and CMIRIAMResource::setMIRIAMURI(). The assignment operator is private as well to make sure that there is only one root container that can be initialized through the init call. Definition at line 175 of file CCopasiRootContainer.cpp. References mpDataModelList, pdelete, and CCopasiVector< T >::remove(). Definition at line 189 of file CCopasiRootContainer.cpp. Definition at line 80 of file CCopasiRootContainer.h. Definition at line 83 of file CCopasiRootContainer.h. Referenced by getConfiguration(), initializeChildren(), and ~CCopasiRootContainer(). Definition at line 84 of file CCopasiRootContainer.h. Referenced by addDatamodel(), getDatamodelList(), initializeChildren(), removeDatamodel(), and ~CCopasiRootContainer(). Definition at line 82 of file CCopasiRootContainer.h. Referenced by getFunctionList(), initializeChildren(), and ~CCopasiRootContainer(). Definition at line 88 of file CCopasiRootContainer.h. Referenced by getUndefinedFunction(), initializeChildren(), and ~CCopasiRootContainer(). Definition at line 81 of file CCopasiRootContainer.h. Referenced by getUnknownMiriamResource(), initializeChildren(), and ~CCopasiRootContainer(). Definition at line 86 of file CCopasiRootContainer.h. Referenced by addDatamodel(), and ~CCopasiRootContainer().